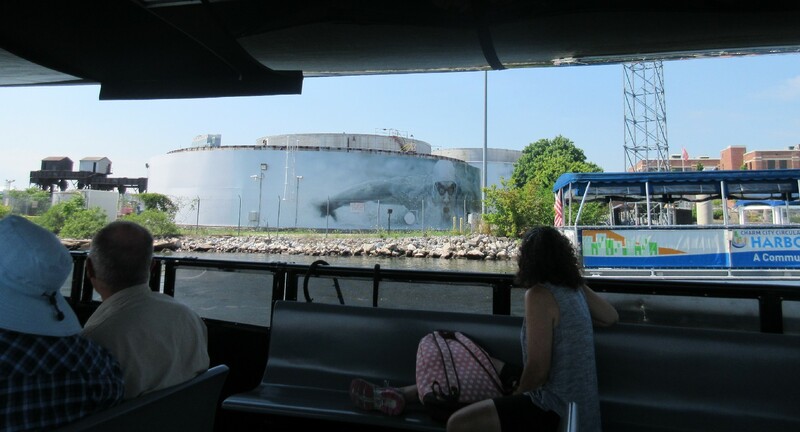 Our 2017 Road Trip, Part 11: Inner Harbor, Spoiler-Free « Midlife Crisis Crossover! Several of these buildings are teaser images for future entries. The white-peaked Pier Six Pavilion at right, on the other hand, has to settle for this cameo. 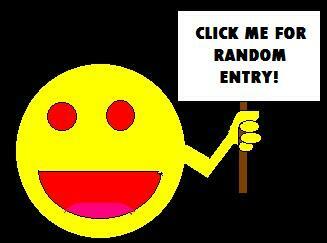 DAY THREE: Monday, July 10th. 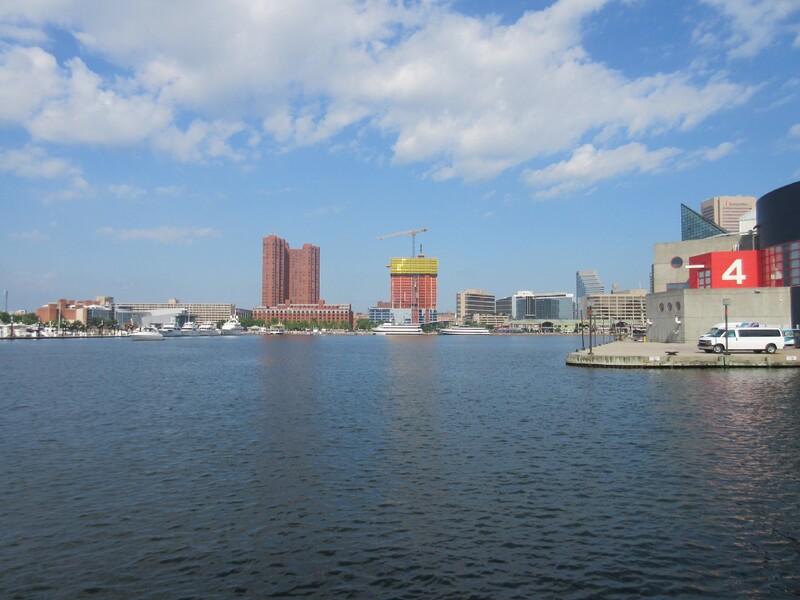 Every piece of Baltimore tourism literature — the brochures, the books, the websites, any TV shows set in the city — strongly recommends any and all tourists spend their time in and around the Inner Harbor. 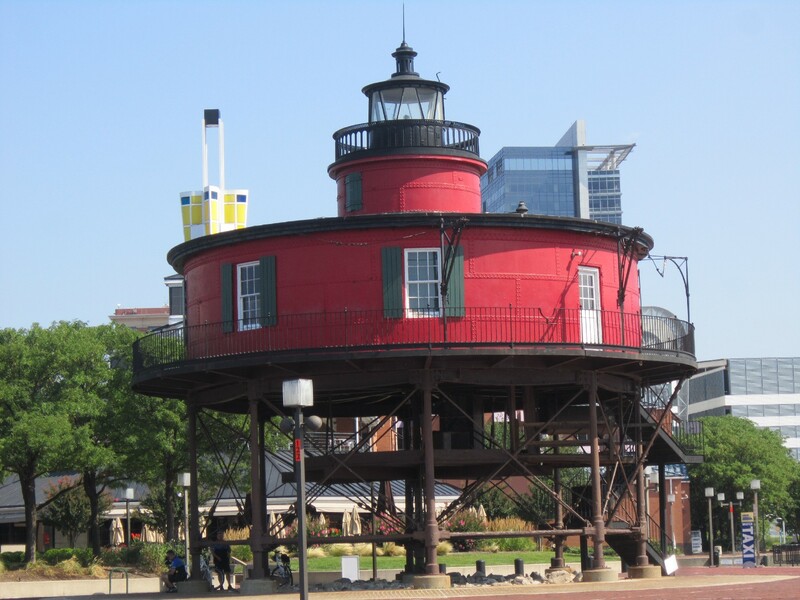 Museums, shopping, pricey hotels, shiny architecture and restaurants of varying price points are clustered at the northwest end of the Patapsco River, making most of their major attractions eminently walkable from one to the other. We found reasons to venture a bit beyond in the days ahead, but it was a scenic place to start. And walking isn’t the only way to travel. But we had to be able to walk before we could travel. 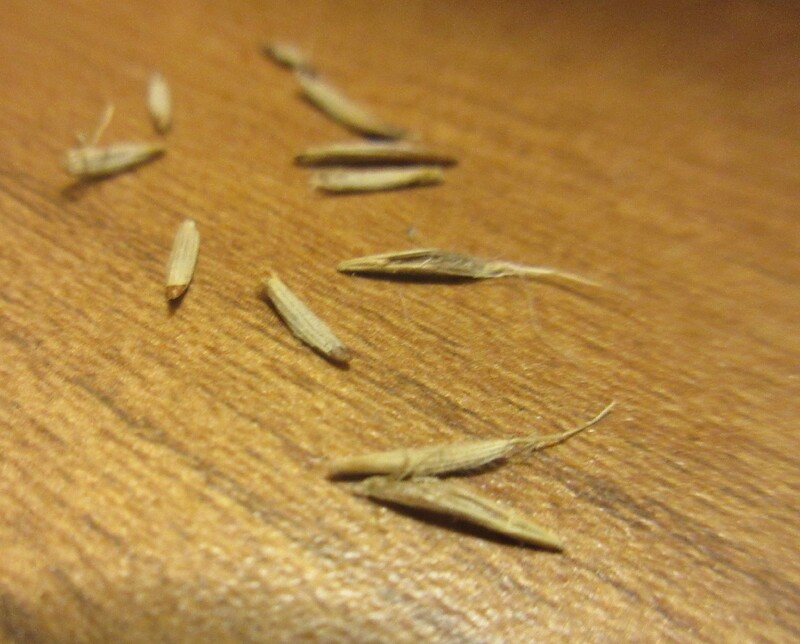 First things first: once and for all, I spent several long, occasionally stabby minutes digging into my shoes and removing every single last prickle from that blasted Antietam battlefield. Despite previous removal efforts, my shoes still felt like sticking my feet into a pair of inside-out porcupines and I had had enough. I left these on the dresser and promptly forgot about them until we left days later. I hope no one on the cleaning staff mistook them for drugs. After breakfast we headed straight to the Inner Harbor and tried to get our bearings. On several piers stand entertainment areas, company offices, historic boats you can tour, and other businesses that weren’t open at 8:30 a.m. Most of the pics we took on this reconnaissance stroll ultimately turned out to be places that we’d visit throughout the week and will eventually star in their own respective chapters. I’d rather not turn this entry into a singular infodump of the entire experience, but we’ll get to more Inner Harbor fun eventually. 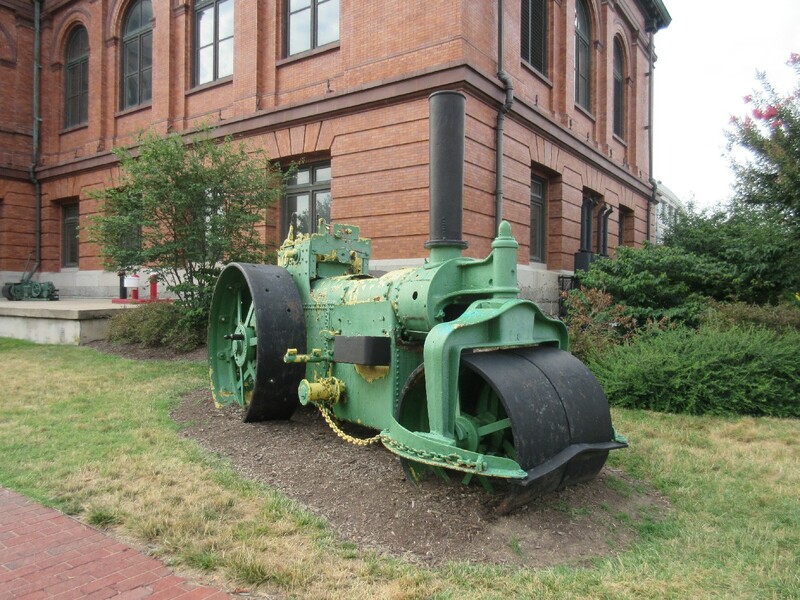 The Baltimore Public Works Museum closed in 2010, but this antique steamroller appears to live on in its name. 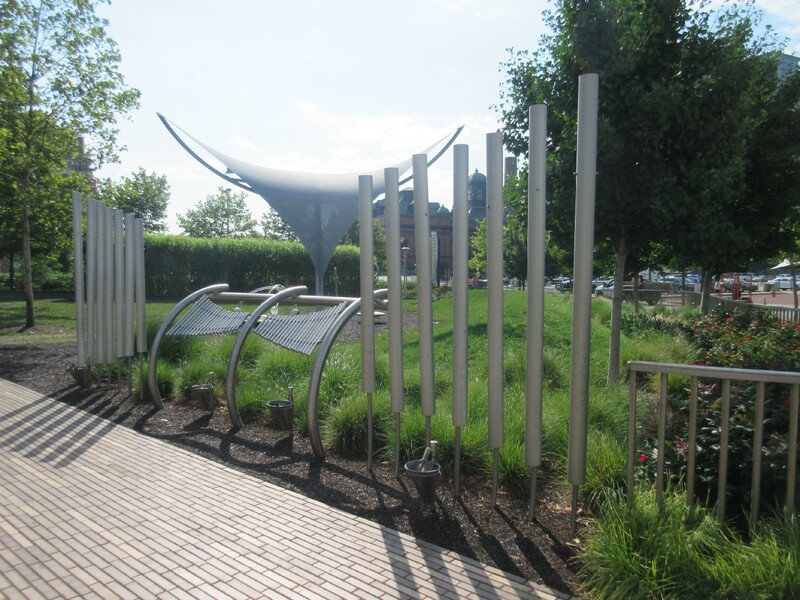 One waterfront office had a modernest playground in its backyard which included these sets of musical pipes. 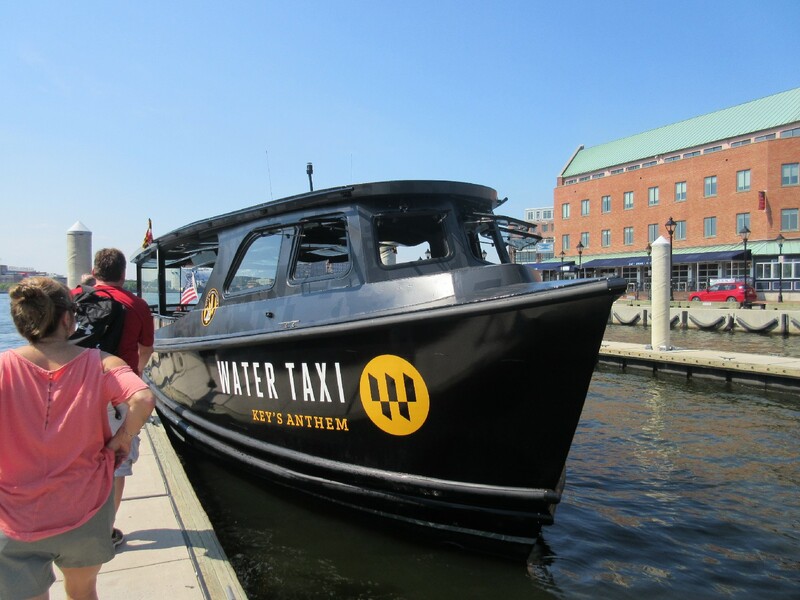 Our plans were on another shore and would require access via another means: the popular Baltimore Water Taxis. A network of boats take locals and visitors alike to and from select piers — fare payable for one-time all-day or on a monthly basis. Part of our preparation for this trip involved cataloging all attractions accessible from each stops, as well as which color of taxi serviced which stops and in what order. I brought a route map brochure with me for reference and assurance. We walked to stop #2 and waited for the taxis to begin their daily runs at 9 a.m. A nearby kiosk bore a route map as well, matching mine. Around 8:50 a pair of guys in professional polo shirts boated toward our stop, replaced the map on the kiosk, and informed us that all water taxi routes had changed effective today. They returned to their little ship and sped off toward their next rendezvous with soon-to-be-confused riders. We let them live and presumed the day’s captains would steer their vessels true and help us not get lost. Ostensibly the new map. 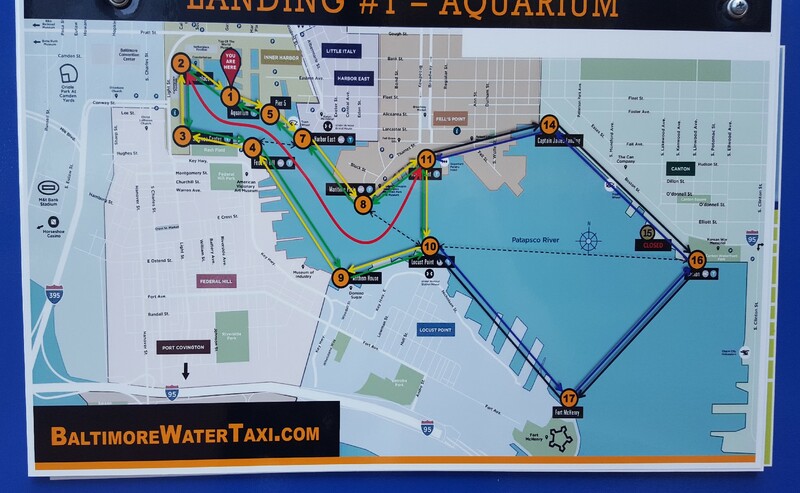 Fun trivia: at least one water taxi we rode in the afternoon was following a course not marked on this map in its assigned color. However, the latter is depicted on the version now appearing on their official site as of tonight. 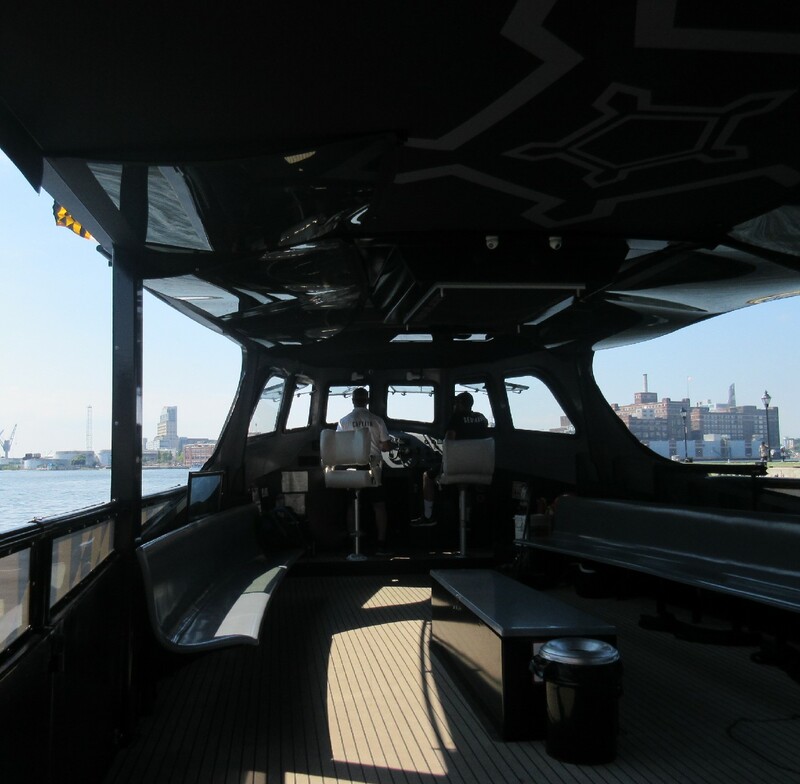 Shortly after 9, our first water taxi departed stop #2, headed our way, and picked us up without issue and with smiles on its two-person crew, the norm across all other taxis we boarded throughout our stay. 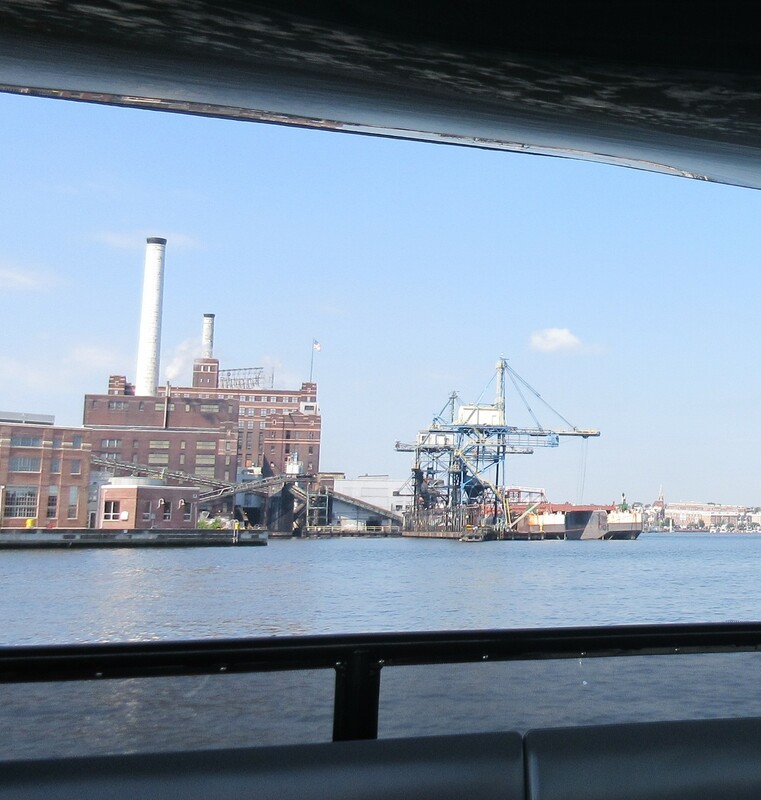 As a value-added bonus, the first mate — or sidekick or commander or whatever I’m supposed to call the one crewperson who wasn’t steering — handed us a VIP brochure, which was similar to my own basic brochure but also included coupons for numerous businesses all around the Inner Harbor. Sadly, it contained the old route map, same as my now-obsolete version. We set aside our qualms for the moment, settled into seats and enjoyed the view. Our rear view as we headed away from the west bank. Our view to the east and onward down the Patapsco. Water taxis come in different sizes, shapes and colors, as do the businesses. We passed the Seven Foot Knoll Lighthouse a few times throughout our trip., but somehow never got to it while walking around. Our long ride required switching taxis at Fells Point, where we’d return later in the week for further exploration. Several confused tourists were milling around the kiosk trying to make sense of the map and, more usefully, of the list of taxi arrival/departure times, which we didn’t see at stop #2. Our next ride, bigger and sleeker. Our new crew hard at work. Docks for private boat owners. “Bah. Those weren’t boats. 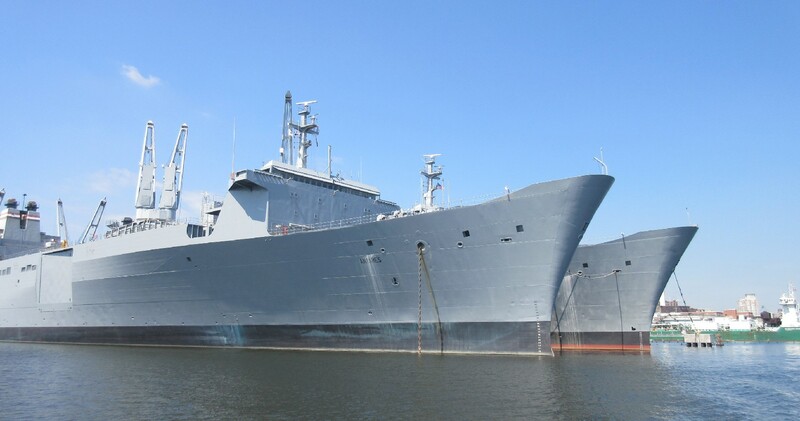 THESE are boats!” said a Baltimore sea captain somewhere, probably. The folks at Under Armour activewear are really proud of their presence. 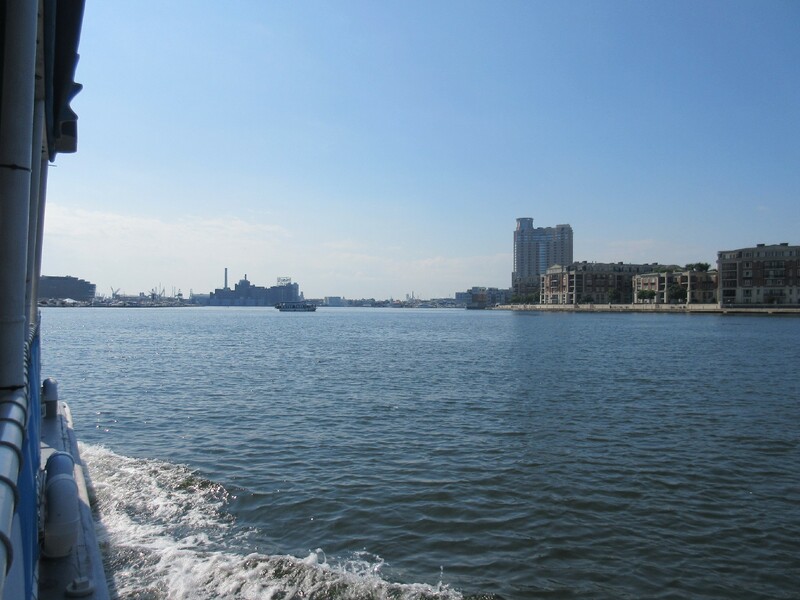 At far right is the Harbor Connector, a limited-run water taxi chiefly for rush-hour commutes back and forth from north to south shore. More cranes, in case the enormous construction site by our hotel wasn’t enough. Industrial concerns multiply on the south shore as you head further east. Also: birdies! 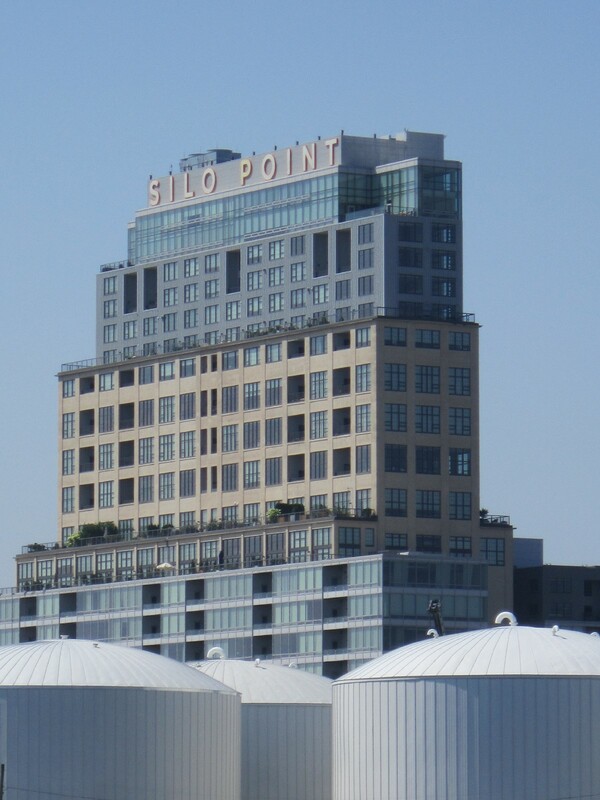 Silo Point, a former grain elevator in Locust Point upconverted to luxury condos in 2009. There’s a brief allusion to it in season 2 of The Wire when we learn it’s in the way of Frank Sobotka’s dreams for the harbor. 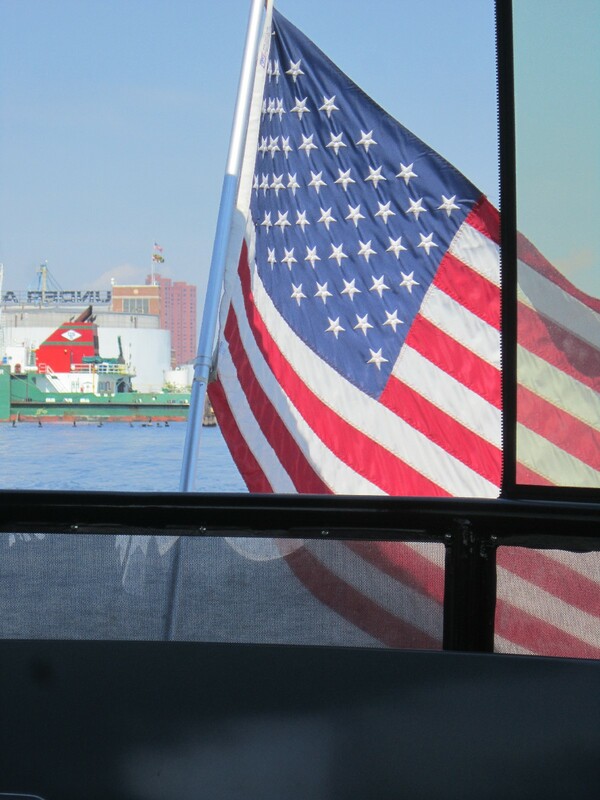 Flying from the back of each water taxi was an American flag, foreshadowing our next attraction.